During May–June 2012, a salvage excavation was undertaken near the marina of Ashqelon, in building lot 52, prior to development (Permit No. A-6504; map ref. 158083–169/620593–715). The excavation, undertaken on behalf of the Israel Antiquities Authority, and underwritten by Gadi Sadot Enterprises and Projects Ltd., was directed by A. Golani, with the assistance of Y. el-‘Amur (administration), V. Essman and Y. Shmidov (surveying), Y. Yolovich (field photography), E. Kamaisky and A. Fadida (ceramic restoration and conservation), I. Lidsky-Reznikov (artifact drawing), J. Regev (14C analysis), N.S. Paran (antiquities inspector), as well as S. Ganor and Y. Israel (regional and district archaeologists). The Early Bronze Age site of Ashqelon has been extensively excavated. Numerous salvage excavations, the majority conducted by the IAA and the former Department of Antiquities (Brandl and Gophna 1994; Golani and Milevski 1999; Wallach 2003; Gophna 2004 and see the rest of the articles in that volume; Golani 2005; Baumgarten 2006, Golani 2007; Golani 2008a; 2008b; Haimi 2009 ; Golani and Paran 2014), revealed extensive remains of a non-nucleated settlement spread out in a wide swath, approximately one kilometer wide, from the region of Tel Ashqelon in the southwest to the region of the Barne‘a B–C neighborhood, five kilometers to the northeast (Fig. 1). 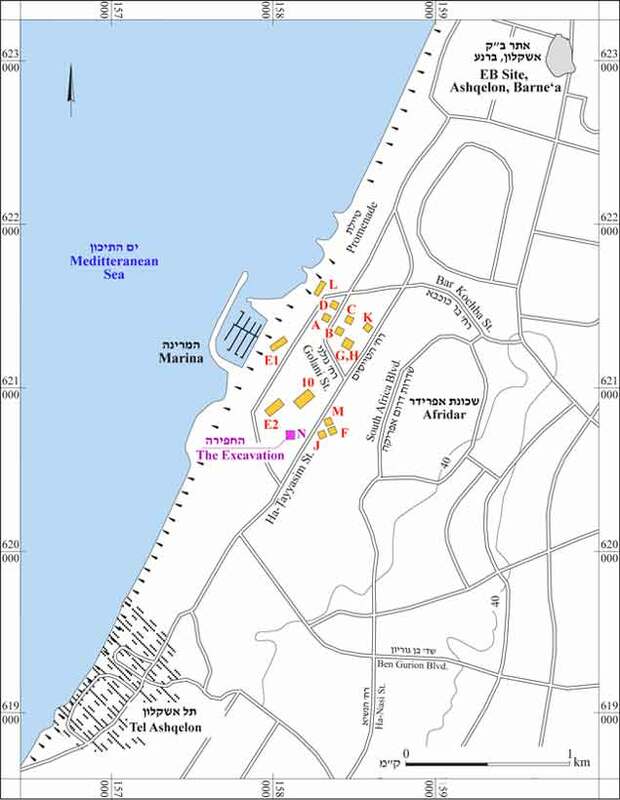 Nearly all the excavation areas in the region of the marina and the Afridar neighborhood have been labeled alphabetically; the present excavation (Area N) is situated approximately 400 m east of the coastline and 50 m southeast of Area E2 (Golani 2004; Golani and Paran 2014). 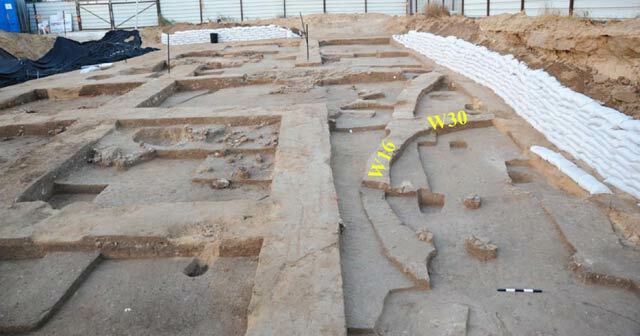 Excavations in Area E2 revealed two settlement strata of the early phase of EB I that contained mud-brick architecture that may represent the remains of a large enclosure and an infant burial, and as well as pits and extensive remains of a metallurgical industry. Like the recent excavation in Area E2, the present excavation revealed two settlement strata (Strata III, II) that date to an early phase of the EB I period, as well as a third stratum (I) that is associated with the Byzantine period (Fig. 2). Stratum II. The habitation surfaces of Stratum II lay directly over those of Stratum III, indicating a complete break in occupation between the two (Fig. 4). One of the main characteristics of the Stratum II occupation, which distinguished it from the earlier Stratum III, was the use of local kurkar stone for building. 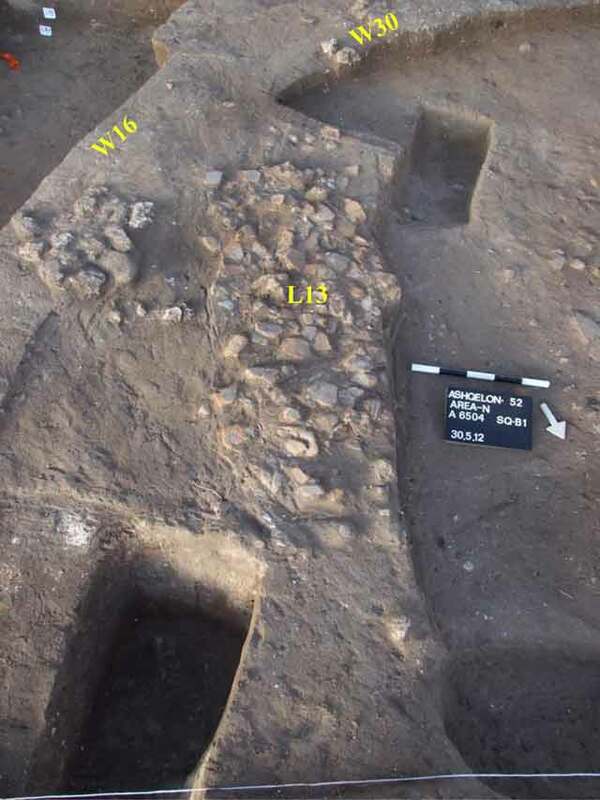 A large concentration of such stones, possibly a collapsed or dismantled structure, or a concentration of building material (L12), was revealed in the center of the excavated area. Part of a stone curvilinear structure (W48) was found in the southern part of the excavation, surrounded by habitation surfaces. A large part of this structure suffered severe erosion damage and later disturbances, yet on its northeastern part, one course of large to medium-sized kurkar stones was still preserved (Fig. 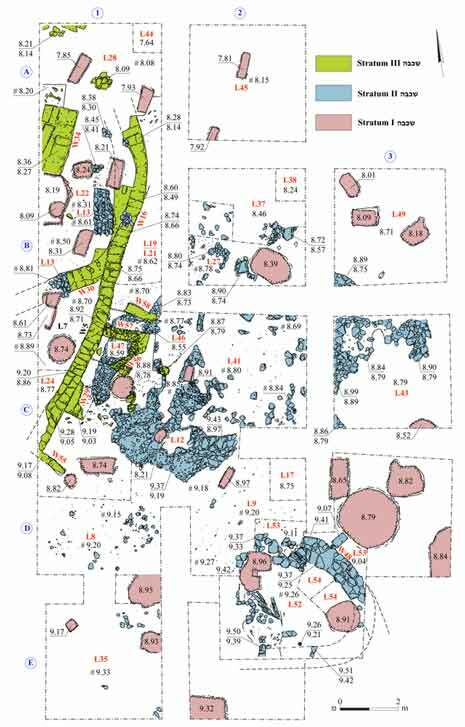 5);this structure seems to have had a horseshoe-shaped outline, and its floor (L52) was overlaid with large quantities of burned destruction debris that included two smashed storage jars found upon it (Fig. 5), a large amount of burned mud-brick and large chunks of burned clay that contained much organic temper. The latter are interpreted as the remains of the clay and straw coating of the roof that collapsed over the contents of the house as it was destroyed. Stratum I included various intrusions and other features, predominantly rectangular, rounded or irregular pits filled with sand, which cut through the earlier remains, causing severe damage. Some of these pits may date to the Byzantine occupation, sparse remains of which were uncovered in the previous excavation of Area E2. The present excavation in Area N is an important addition to our understanding of the Early Bronze Age I occupation at Ashqelon. The findings in Area N also appear to relate well to those excavated in Area E2 (Golani and Paran 2014), where the mud-brick architecture of Stratum III was superceded by the stone and mud-brick architecture of Stratum II. The building in Area N, Stratum II, which seems to have been destroyed by fire, is so far unique at Ashqelon. Baumgarten Y. 2006. Ashqelon. HA-ESI 118. Brandl B. and Gophna R. 1994. Ashkelon, Afridar. ESI 12:89. Golani A. 2004. 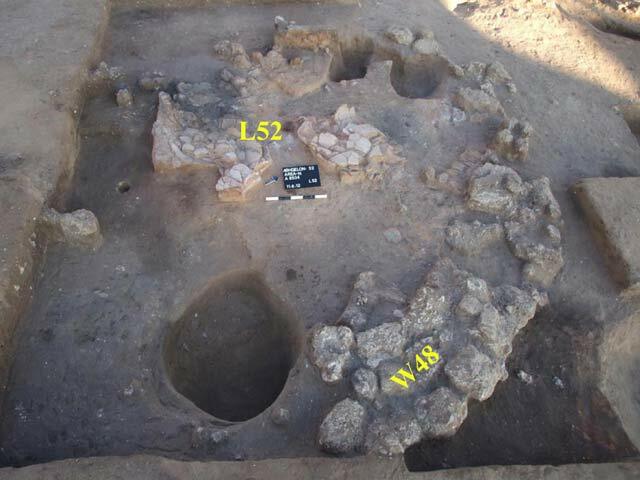 Salvage Excavations at the Early Bronze Age Site of Ashqelon, Afridar—Area E. ‘Atiqot 45:9–62. Golani A. 2005. Ashqelon, Barne‘a B–C. HA-ESI 117. Golani A. 2007. Ashqelon, Barne‘a B–C. HA-ESI 119. Golani A. 2008a. Ashqelon, Barne‘a B–C. HA-ESI 120. Golani A. 2008b. The Early Bronze Age Site of Ashqelon, Afridar—Area M. ‘Atiqot 60:19–51. Golani A. and Milevski I. 1999. Ashqelon, Afridar (A). ESI 19:82*–83*. Golani A. and Paran N.S. 2014. Ashqelon, Afridar Area E2. HA-ESI 126. Gophna R. 2004. Excavations at Ashqelon, Afridar—Introduction. ‘Atiqot 45:1–8. Haimi Y. 2009. Ashqelon. HA-ESI 121. Wallach Z. 2003. Ashqelon (A). HA-ESI 115:58*–59*. 2. Composite plan of excavation. 3. General view of excavation, looking south. 4. A Stratum II Surface (L13), with numerous ceramic remains, directly overriding W16 of Stratum III, looking south. 5. The heavily damaged remains of the curvilinear structure, looking west. Note the remains of two smashed storage jars on the floor.